That’s what I used to think. That is…until I met my wife 10 years ago. Before we met, she had the opportunity to experience the Sahara Desert in Africa. And, man, she fell in love with the desert during that trip. So, for the first few years we were together, the conversation of going on a vacation to the desert would come up now and again. My first, second and third thoughts were always…Desert? A vacation spot? I don’t think so. But, within a few years, we were on a plane from NYC to New Mexico. It was awesome. The landscape was beyond inspiring. The people were nice. The roads were empty. And there was really cool art in Santa Fe. Today, I want to keep it short and sweet. It’s Friday. The weekend is coming. Time to relax, hopefully. And, that is what the desert was to us — relaxing! Its vast openness. The lack of development. The simple yet eloquent landscape. All of those attributes made it a place to find some peace and quiet, and some inspiration. Inspiration for what? Anything, really. It’s up to each person to find their own inspiration. And, to me, looking out into a vast emptiness has a certain calming effect. 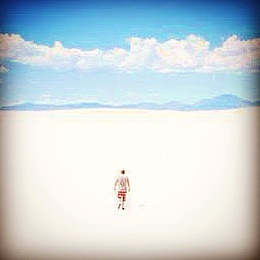 Here’s a photo of me in the White Sands desert. And I also posted a video of awe-inspiring desert landscape with some relaxing music. Enjoy, relax and be inspired! I had the opportunity to visit the deserts of Nevada many years ago. But as a young college student, I didn’t appreciate the calm, peaceful aspects of the vast desert . These days I long for relaxation and you have inspired me to seek out these places that would provide that for me. Shamala, I am so happy that my post inspired you. We only live a short drive from the deserts in California. Hopefully, you will make it out here, and we can all check out the deserts together!